Those of you that follow my Facebook, Twitter or Instagram accounts will have seen that in recent weeks I shared a number of photos of people with pins through their arms and clamps attached to their body as a result of the hypnotic anaesthesia and analgesia that we created during class exercises. On occasion, I hear it mooted (glibly) that we (this college) are incredibly theoretical and academic, and that is correct – we are. I think it is a major strength for an educator to actually thoroughly educate. We do have a strong leaning towards evidence base, we familiarise our students with the academic literature supporting this field and how it is effectively incorporated into real-life therapeutic and clinical environments – however, we walk our talk massively here too. Everything we learn about, we test and engage in practical application of; I run marathons, compete in ultra marathons and engaged in sports including weight lifting to high standards to demonstrate the application of my work and in particular my “hypnosis for running” research and books, and likewise, I have been known to lecture and teach with a surgical clamp attached to my hand to demonstrate my own ability to create hypnotic anaesthesia before working my others and expecting them to do so in my classes too. 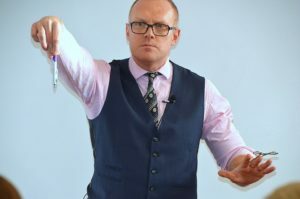 Here is a picture of me doing just that (hypnotic anaesthesia on my arm) when teaching in Iceland earlier this year, when I passed the clamp around the class afterwards, virtually no-one was able to even close it on their hand, let alone keep it there for a few seconds. I had it on my hand for 15 minutes and taught my class at the same time….. Anyway, I thought it would be interesting to share a small snippet that was filmed just yesterday in my class, from a demonstration I give regularly. 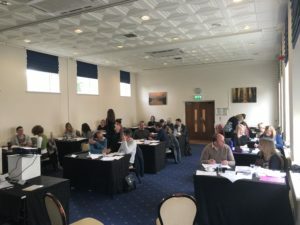 We had spent the day learning about the evidence base and theoretical underpinnings of using hypnosis to alleviate varying types of pain and in the afternoon were moving on to talking about using hypnosis for anaesthesia and analgesia. One thing I make very clear prior to this demonstration is that this (as with all so-called “hypnotic phenomena”) can be achieved without hypnosis – people who attend my classes have had injections, given blood, had tattoos and so this process is not always about proving something that can be done in hypnosis that cannot be done without it – what it always shows very overtly is how much we can control and lower pain, how we can dictate swelling, soreness, how we can directly influence and effect bleeding and blood flow and impressively – how we can advance healing in ways that seems quite magical. 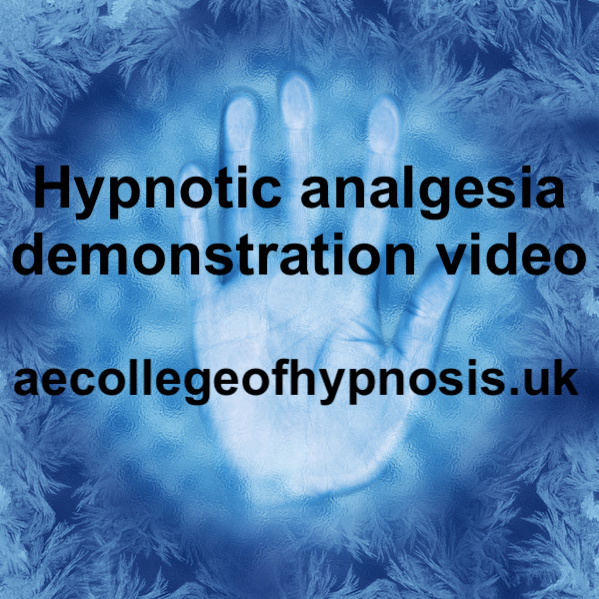 Hypnosis typically amplifies and magnifies many things that we are quite capable of doing anyway, and this hypnotic anaesthesia demonstration highlights that beautifully. I had a volunteer – a brilliant student of mine named Kim, who is going to go on to be an equally brilliant hypnotherapist. She was keen to have some evidence of what she herself was capable of doing. We discussed how we were going to tailor this hypnotic anaesthesia demonstration for her (thus some of the suggestions used in this video snippet were using her imagery and wording elicited prior to starting with the hypnosis) – it is also incredibly important to mention that I frame this process as I do with virtually every client session, class exercise and demonstration, that this is not all down to me, the hypnotherapist. It is a collaborative experience and I talk through in detail the optimum mindset to adopt through the exercise to advance the outcomes. This is typical and characteristic of my favoured sociocognitive perspective of hypnosis and is ultimately what led to my entire class going on to create full-blown hypnotic anaesthesia on each other later on in class yesterday – they all readily applied the hypnotic cognitive mindset that creates such responsiveness to hypnotic suggestions. This is an excellent group – as tends to happen in our classes, when coffee break comes around, people are not running out or printing for the doors, they stay in class, they talk, they reflect upon what they are learning, it is sometimes tough to get them to go and grab some refreshments, here you’ll see most of the class are in their seats during morning tea break…. 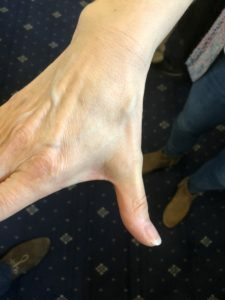 So here is the snippet of the hypnotic anaesthesia demo, just the bit where I put the needle through, we get a close up of the needle being right through the hand, then I take it out and have a couple of people from class come and feel Kim’s hand and verify what I was telling the rest of those present in class – not only was it greatly discoloured, but it was also incredibly cold to the touch, and in stark contrast to her other hand which was usual temperature to the touch. More evidence of how wonderfully she had created the arm anaesthesia responding to suggestions of coldness, iciness and analgesia. We had done the induction, no deepener beyond the imagery and suggestions used for creating the anaesthesia and the session had been less than 5 minutes before I got to this stage where I out the needle right through her hand. Following this I proceeded to give Kim some suggestions for enhanced healing using a particular protocol I teach to my class. What would you know, despite there being some slight spots of blood when the needle was placed through her hand and using quite a thick needle, within a couple of minutes of the session coming to an end, this is Kim’s hand, with very little sign of a needle having even gone through her hand; no pain, so swelling, no soreness…. And here is Kim at the same time, with a big smile on her face, right after she told me that this experience had been “magical” for her, still duly amazed at how her body had responded to the healing suggestions. 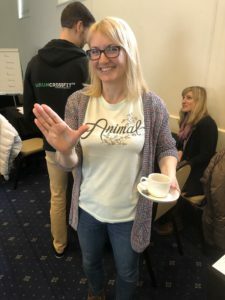 Kim has had time to reflect upon it and has told me how much she recognises the importance of the right mindset and how important the working alliance/therapeutic relationship is – she learned a great deal on many levels here. 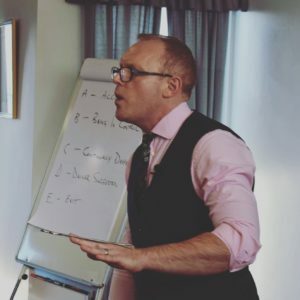 I love doing this demonstration, I love seeing how people respond to it, and the joy that it brings to my students and graduates when they get to see some really impressive outcomes from this application of hypnosis. We get to offer up some proof at least that supports the evidence and strong theoretical underpinning that had been discussed in class up until then. THere you have it, hypnotic anaesthesia! I hope you enjoyed reading about this as much as we all did being a part of this in class yesterday. Big thanks to Kim for volunteering and letting me share her experience and brilliance from yesterday too. 1. Would you like a satisfying and meaningful career as a hypnotherapist helping others? 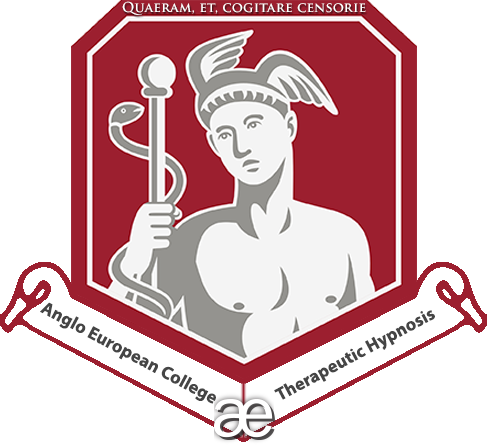 Are you a hypnotherapist looking for stimulating and career enhancing continued professional development and advanced studes?